These woods are dressed up for the holidays! 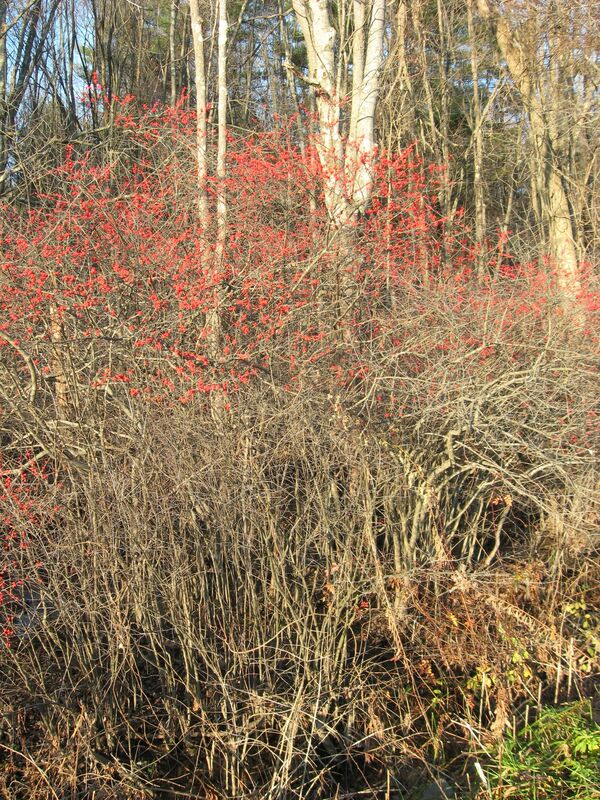 This native shrub is found in drainage ditches along many roadsides in Western Massachusetts. It is tolerant of wet soils. 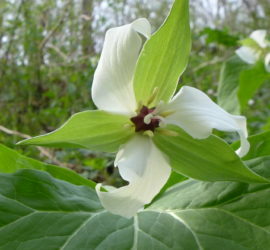 It is found alongside Skunk Cabbage and Jack-in-the Pulpit. 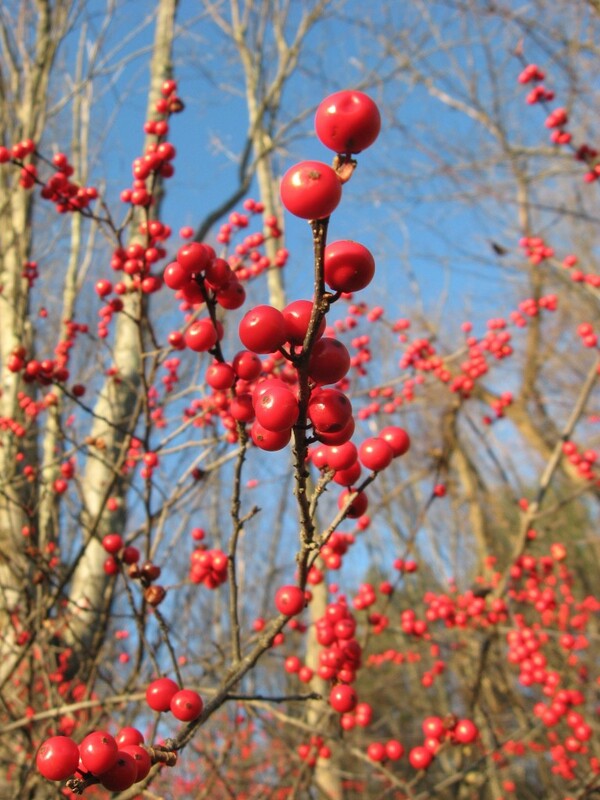 Commonly referred to as Winterberry, Ilex Verticillata is also used as an ornamental, because of its stunning display of bright red berries in the late Fall and Winter. The more sunny the location, the more berries. 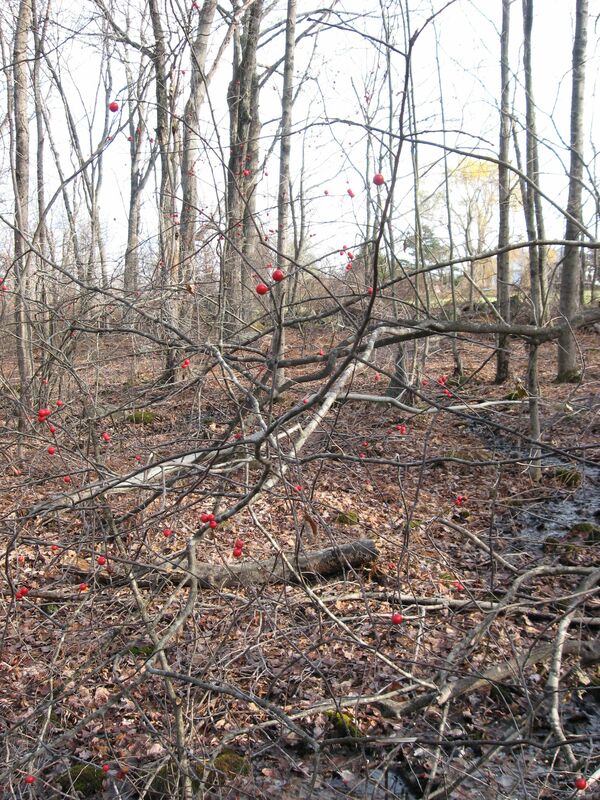 Here it is growing deeper in the woods, with much less berries, but still thriving. Here is the same scene, as it was in June 2011. Its quite a difference in this spot from season to season. The late Fall woodland is very charming even without the lush greenery. 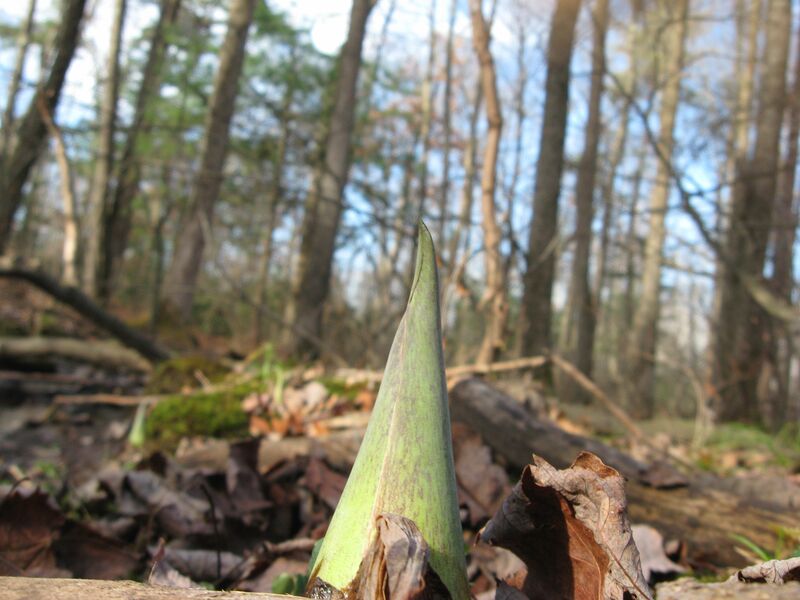 The Skunk Cabbage is poking out of the moist forest floor, ready for blooming at the end of winter. If there is too much snow, this one will create its own heat and melt the snow, so it can bloom. Here is the Skunk Cabbage in the same forest in June 2011. 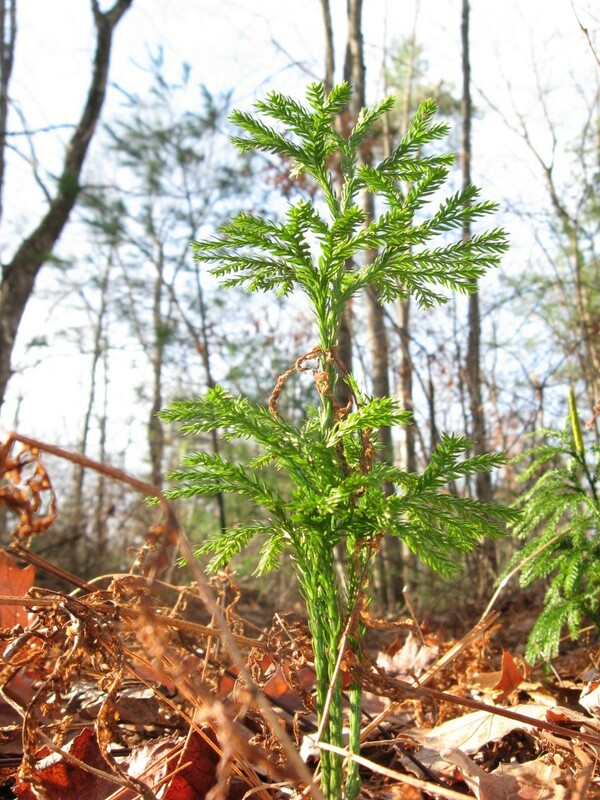 Commonly called Ground Pine. The forest floor is decorated with them, most just about six inches tall. 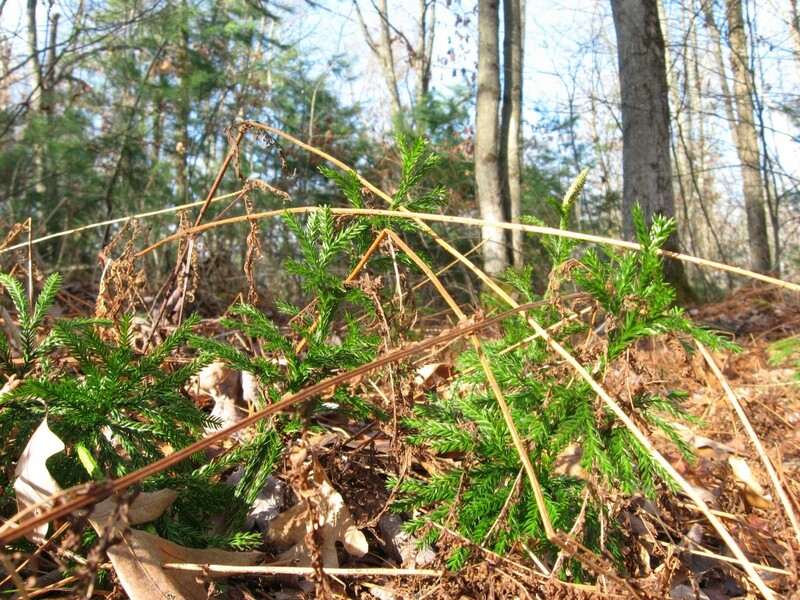 The Ground Pine thrives in this immature forest, which used to be farm fields. 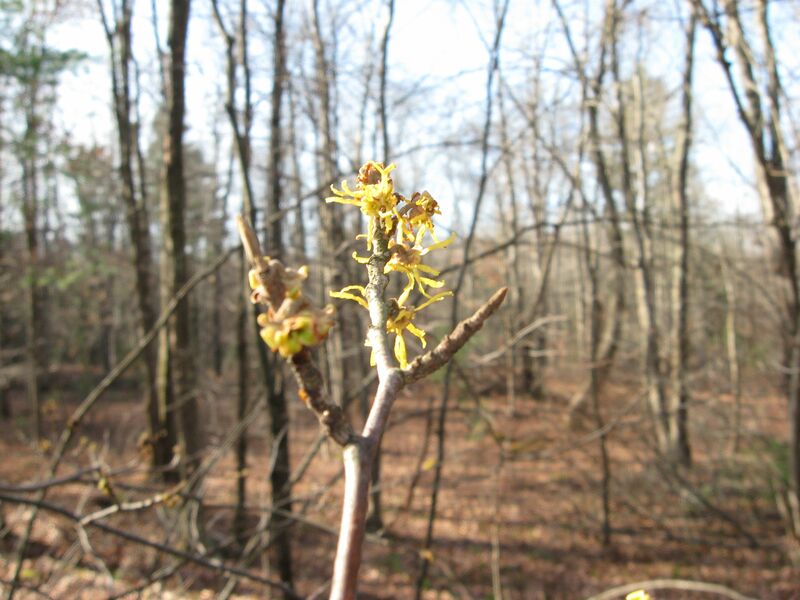 Whole groves of blooming Witch-Hazel adorn this festive, late Fall forest. Thank you for sharing this great post. Do you think that the more you study plants, and take hikes and observe nature, the more you develop an appreciation for the late fall and winter landscapes? Here in Philadelphia, the Lonicera sempervirens is still blooming in our backyard, but it mostly carries berries at this stage. They are of a beautiful bright red quality. Lonicera sempervirens turns out to also be a great choice in the native plant garden, for its late fall festive touch. Isabelle, Yes to the question. The more learned, the more appreciation for winter is obtained. The relentless freezing temperatures and less daylight present their challenges, and I may be less charitable in my assessment if asked again in mid-February. Of course, here in Southern Georgia it was in the 70s today and Winter seemed a distant thought in some far off northern reach. That is great to here that the Lonicera sempervirens is STILL Blooming! I will have to amend a poem I wrote which mentions skunk cabbage. I read that they burrow deep into the earth, one of few plants which do that, and also that they generate heat, but did not know that the ability to be warm would keep the sprouted plant alive through the winter. Imagined instead that the sprout turned around and burrowed into the earth. 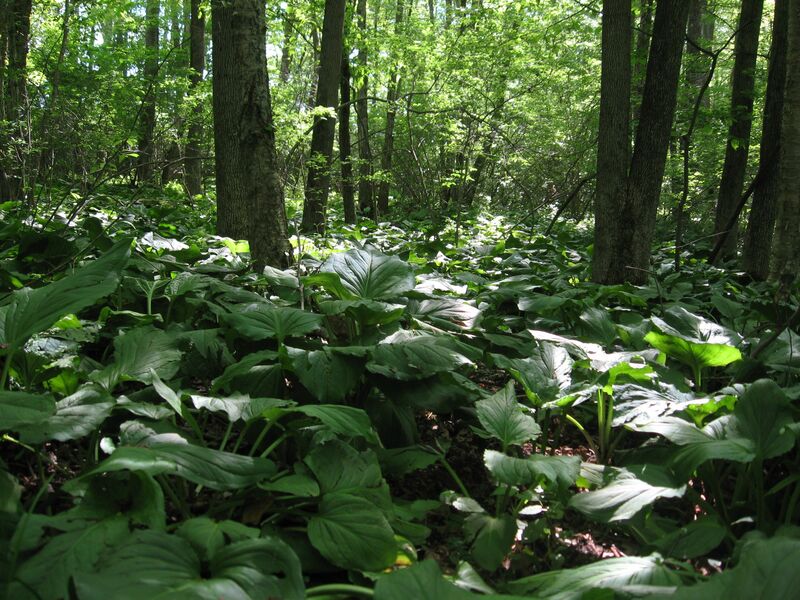 What is also poetic about the Skunk cabbage is that the plant can live around 100 years! Talk about a perennial! It has a big old root that creates what looks like a 4 inch tall green fang sticking out of the ground every fall and winter. Inside is the flower all folded up in an embryonic state, and behind that the great big leaves, which don’t come out until a bit after the flower is done. 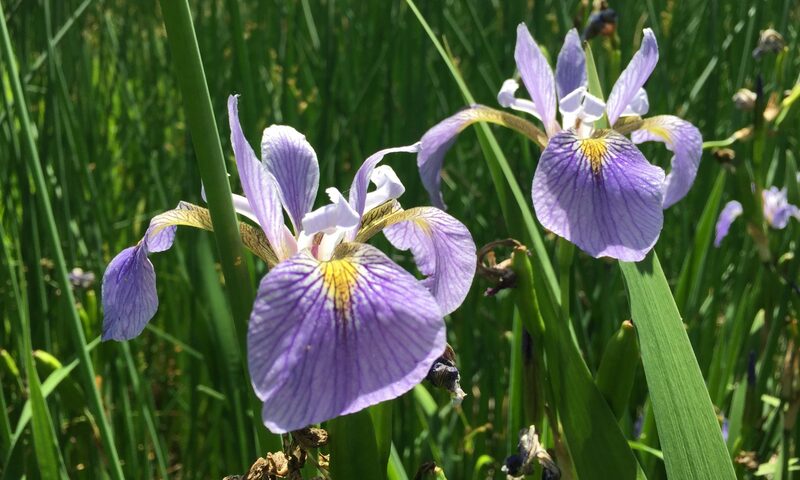 The plant’s ability to make heat may have something to do with it surviving freezing temperatures, but also so it can melt the last snows away so the blooming flower can be pollinated. Its the first to bloom! I made some interesting photos of the red Ilex berries with the old B&A railway station at Gilbertville, Massachusetts in October. I knew all about the railway, but nothing about the berries! The railroad cut provides sunshine that will make the Ilex robust with berries. The drainage ditches along right-of-ways also creates a perfect place for them, being that they thrive in moist environments. Quite something how different a forest looks from June to November. 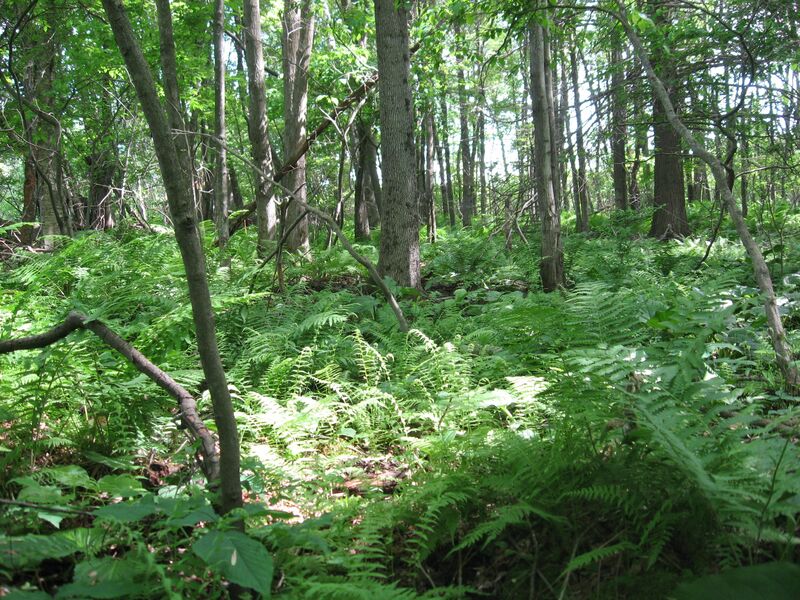 It is amazing how many ferns carpet the forest floor and then how most of them die back, except for the evergreen Christmas fern and Marginal Wood fern.